Located off of Route 114 in Andover, MA, Boston Hills was one of your typical Eastern Massachusetts ski areas that offered skiing to the high populations of suburban Boston. The area was opened in 1957 and was founded by Bob Dunn. The area first opened with a J-bar lift and few rope tows. The area originally had a few wide slopes and an 1800 foot beginner trail. There was also snowmaking at this area in the late 1950's, and was one of the first areas in the country to have it. A double chairlift was installed around 1971, which increased the uphill capacity to somewhere near 4500 skiers/hour. The J-bar lift was removed and installed at Hamilton Ski Slopes. One of these J-bars was found in the woods at Hamilton by Jeremy and Betsy in 1999. Here's a picture of the J-bar (taken at Hamilton). The bar now resides at Jeremy's parents home in Chelmsford, MA. The area added several more slopes during the early 1970's, likely around the time that the double chair was installed. The owners decided to make Boston Hills into a summer recreation area as well. During the late 1970's an Alpine Slide was added. While the vertical was only 240 feet, I'm sure this was lots of fun! The alpine slide continued to operate until at least the early 1980's. I wish I had the chance to check it out, as I only lived 10-15 miles away in Chelmsford. Perhaps the most unique summer attraction at Boston Hills was summer skiing! This was installed during the early 1980's. They installed a mat with bristles on the whole front slope. You would ride the chair up, moisten your skis with water or a lubricant, then ski down! Unfortunately, you can imagine what would happen if you fell...lots of bruises! For more information on the summer skiing, read some of our readers stories below. Unfortunately, the area closed at some point during the late 1980's. The exact reason is unknown, but was likely due to local competition, such as Bradford, Nashoba, and Wachusett, as well as non snowy winters. Here's a topo map of the area. During the 1990's, an archery shop took over part of the base lodge, but this would close as well. Throughout the 1990's, the Hall double chair remained in place, and the trails were at least mowed, because there was little growth. Here's an overhead view of the area. Notice the few wide slopes, and a few narrow trails. I visited the area in April of 1998. While the land was posted no trespassing, I did get this shot of the double from Rte 114. It was a Hall and was painted yellow. During the summer of 1998 I did some hiking in this area, as there are lots of hiking trails behind the hill. When I got to the top of Boston Hills I was hoping to find the double intact. It wasn't - it had been removed by the town, unfortunately. I am not sure where it went. According to a few NELSAP readers, the area is/was slated to become a housing development. John and Linda Osgood: I grew up in North Andover and skiing at this place. My dad made snow there in the mid '50s. My father worked at Boston Hill for about two winters in the late '50s when the J-bar was brand new. The chairlift was put in about 1971 or so, and I can remember that myself. Andy Gaudet checked out the area in 1999: My Name is Andrew Gaudet. I live in Andover, Massachusetts. 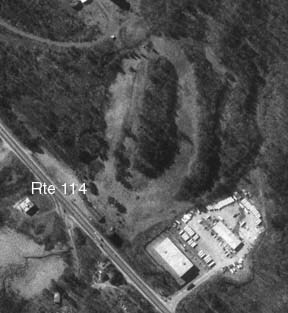 I have recently been to an old ski area on Rte 114 in North Andover. I have been there and had urge to climb the mountain. I also peeked into the old lodge. Very sad, as I saw rotten tables and broken chairs. The city as demanded that the ski lifts be taken down and the towers also. They left the snow groomer in the parking lot. The maker of the groomer is "Valley Engineering in Gray, Maine 04036. The double chair is completely gone , Found the ropes/towers for an old J-Bar! I continued over to the Lodge. Still is perfect condition, except the deck is decomposing fast. As I continued my search I found a an old sno-packer deep in the woods as well as the J-bar towers. I wonder how they got here? Oh well I still wanted to find a brochure or a map. I continued looking and It started to drizzle so I was just about to call it quits when I happened to look on the ground and there was an old 1980s promotion flyer for Boston Hills. Good enough for me, I thought! DGROHMAN: My information is a little foggy since this dates back to the early to mid 1980's. 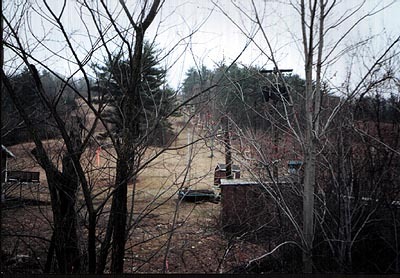 However, you may also be interested in knowing that Boston Hill also operated as a ski area during the summers. That's right. They had a slope that was carpeted or had that rough astro-turf type material, very abrasive. You could also "roller-ski" at that time. Roller ski's were a device that looked something like an army tank tracks, you could lock in to them with a binding. Maple Valley in Vt. also had the roller blades. I was shown them one winter in the 80's and was told you could ski on grass this way. Joe Giordano: Many people went for the Alpine Slide, as I did in the late 70's and early 80's as a pre-teen. However, I was always impressed with the "tractor skiing" on the grass as well as these huge mats that were rolled down the slopes and people skiied with their regular skis. Michael Torres: Boston Hill operated for skiing one summer in the early 80's. They covered the slopes with some mats that were developed to work like groomed snow. I think they were on of the first, if not the only ski area to try this. Not enough people braved it and many who did got rasberry rashes from the falls. Tom Cronin: My Father use to take my bothers and sisters skiing at Boston Hills at least once each year in the 60's. It happen to coincide with the "Boston Globes" Learn to Ski Free Clinic hosted at Boston Hills. With 6 kids and 1 income the old man was creative in finding ways to get us out there for little to no cost. Frank Corrao: Around '81 or '82 there was "summer skiing" at Boston Hills. The main slope was entirely covered by a honeycomb mat made of nylon bristles just like the ones at the top of chairlifts on the offloading ramps. You see this kind of mat at the end of the season when snow gets scarce. You take the double chair to the top and once there you would run your skis over a giant sponge in a baking pan. The sponge was soaked in what I was told was liquid silicone. The skiing was pretty good. Almost as fast as natural snow although very technical. If you caught an edge you were going down and it would be very painful.It would give you a very bad road rash. I know this sounds pretty strange but it did happen and I can't understand why other ski areas didn't try this mat also. I think it was only one season at Boston Hills and more popular areas might have been more successful with this idea. This was one of my great ski memories as I will always remember skiing in Mass. on July 10. A5523458: I skied in the summer of 1982 or 1983 at Boston Hill. The area imported a "rug" type plastic surface which resembled an upside down hair brush which covered almost the entire front trail. Regular skis were used. To make the skis slide better you wet the bottom with water. It was a "ski like" experience. I think I only went twice. Frank Hocter: I learned to ski at Boston Hill in the late 60"S I then joined the Ski Patrol in the mid 70"S to the early 80"S. there was an old building across the street we used to rent to have a place for the instructors and ski patrollers to gather at the end of the day (building still there). The owner then bought into Ragged Mountain in Danbury NH. and when the snow left MA. we would go to Ragged and ski and patrol up there. They also hosted a Pro Skiing competition there . I think it was in the late 70's, also they held the Boston Globe's ski clinic there each year. Bob Dunn (the owner of Boston Hill) ran the clinic. I believe Bob Dunn runs the ski school at Bretton Woods, NH. Eric Benson: Having grown up in Andover and North Andover, Boston Hill Ski Area was always the place you could wrangle somebody's mom to drop off a car load of us for the day. 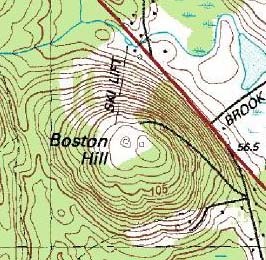 Although I learned to ski at Bradford Ski Area (in Haverhill), Boston Hill was the place to be because they had better terrain and a chair lift (Bradford only had T-Bars). In the mid 80's, while in high school, I worked at Boston Hill in the rental shop on the weekends and as a snowmaker during the week for 2 seasons. In the summer, my weekend job was working on the Alpine Slide and general maintenance of the slopes, lift, lodge, etc. The owner, Bob Dunn, was an innovator in a lot of ways. His was the first ski area in the country that had snowmaking. Conveniently, modern snowmaking was developed in Beverly, MA and was soon on the Hill in North Andover (not certain of the year). He added twin alpine slides in the late 70's (he also owned an alpine slide in Jackson, WY which was run by his daughter). In 1983, he added material called Dendix (sp?) matting to the entire main run of the hill with the idea of year round skiing. This is the same 'brushy' material that free-stylers use on jumps in the off season. During my tenure at 'The Hill', Bob Dunn was The Boston Globe ski columnist and frequently had free 'Globe Sponsored' ski clinics at the mountain. Bill Cullen: I remember skiing Boston Hill in the summer late in the 80's. They had a white bristly hexagonal plastic mesh on the slope that substituted for snow. The grass could grow right through the open parts of the mesh and falling was painful to say the least. To get any kind of speed, you had to dip your skis in a pool of some gunk up top, which might have been silicone or some kind of WD40 type of stuff. This whole thing was really a lot of fun for an hour or two, and a lot of work in the heat. Bloody elbows and knees were my most vivid memory of the day. Alex Loth: "I grew up about a half mile from Boston Hills, yet my only memories are sledding there after they closed down. (I thought they closed in the early 80's) The alpine slide had two tracks which ran right next to each other down the hill. We would hike up the hill and pack the snow down on the slide, creating our own private luge run. The races were high-quality, with just enough danger to make the day that much more fun, whipping down the hill on plastic sleds. The land off the south side of the hill is part of the Trustees of Reservations and is a beautiful place to hike. There are views all the way to the skyline of Boston both from the south side of Boston Hill and the next hill over, Holt Hill in Andover."